MY FIRST VERY BIG BIBLE STORIES: These enormous A3-sized storybooks are ideal for reading aloud to groups of preschoolers and early readers. Each features a fully illustrated Bible story, explanations of 'special' words, a prayer, and a Q&A discussion guide. Ages 3-7. Paperback. 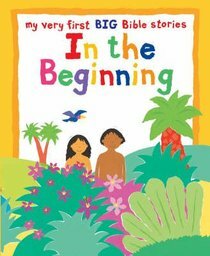 About "In the Beginning (My Very First Big Bible Stories Series)"
This big book is ideal for shared reading. Derived from the award-winning "Myery First Bible", the well known story from the book of Genesis is presentedn simple words and illustrated with child-friendly paper collagellustrations. Notes are included for parents and teachers putting the storyn context and giving ideas for discussion and exploitation of the text andllustrations. The full text is replicated on the back cover for ease of use.his book is published simultaneously with The Lost Sheep. These two newitles take their place alongside 4 other big books: Noah and the Ark, Jonahnd the Whale, Baby Jesus, and The Good Samaritan. Meant to be used for shared reading, this book is derived from the award-winning 'My Very First Bible'. The story from the book of Genesis is presented in simple words and illustrated with paper collage illustrations. Notes are included for parents and teachers giving ideas for discussion and exploration of the text. Margaret Mayo has written a number of books for children. She lives in Brighton, England, with her husband and three children.ýAlex Ayliffe has illustrated many books for children. She has traveled extensively in Europe, Africa, and Australia, and currently lives in Hertfordshire, England.